Looking at the graph above there are periods in the year where there is agreement about changes in precipitation, and others where the models disagree. 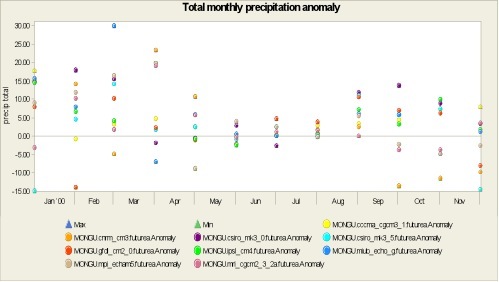 From January to April, which covers the peak of the rainy season, at least 7/9 models agree that there is likely to be an increase in precipitation, however there is a large range in the change that they project. Looking at daily values, which give more detail, all models agree that late January and February will see an increase in precipitation. All of the models agree that there is an increase in September, but the models are split about changes to the early part of the rainy season. There is some indication that the intensity of rainfall will increase during January and February, but this isn't a clear signal. Work from Mark Tadross of UCT on changes in growing season in southern African countries.